Citation: Shah N, Purcell R, Cooper A, Roman D. Temporal-Parietal Scalp Squamous Cell Carcinoma: a case report and review of literature. Skin Dis Skin Care. 2016, 1:1. Introduction: Squamous cell carcinoma is the second most common form of aggressive skin cancer and is due to exposure of ultraviolet radiation (UV-B), immunosuppression, inflammation (from trauma or burns), and chemicals. It is most common in older, white populations in Europe, United States, and Australia. Primary lesions occur most commonly on the face, neck, ears, hands and arms but metastases are uncommon. In contrast, squamous cell carcinoma is uncommon in younger and darker-skin individuals, especially those living in Africa. 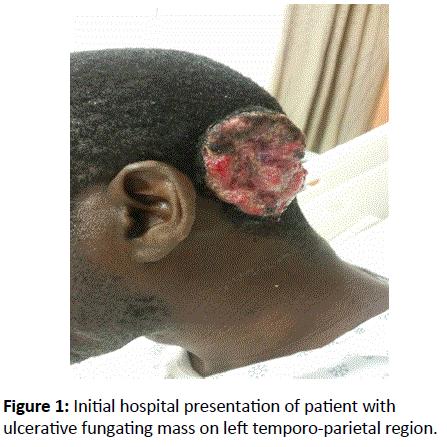 Case presentation: In this case, a 37-year-old native African man, without any significant past medical history, presented to the hospital with a well circumscribed, ulcerative lesion of the left parietal-temporal scalp which had not healed for four years. Head CT evaluation excluded distal metastasis. Wide superficial local excision with ipsilateral occipital lymph node biopsy revealed an infiltrative well-differentiated squamous cell carcinoma with metastasis to a left occipital lymph node. Pathological examination of the deep marginal excision with ipsilateral posterior cervical lymph node biopsy did not reveal any residual carcinoma but did show benign follicular hyperplasia in the cervical lymph node. He underwent a split thickness skin graft of the scalp wound. Systemic chemotherapy will follow. Discussion: Although the incidence of squamous cell carcinoma is lower in younger, African people, it is important to consider the diagnosis for a suspicious lesion. It is essential to utilize both surgical and histological examinations to establish a diagnosis. However, the correct management of squamous cell carcinoma is debatable, especially on the scalp. Squamous cell carcinoma (SCC), also called squamous cell cancer or nonmelanoma skin cancer, is the second most common form of skin cancer following basal cell carcinoma. The incidence of the disease has increased up to 200% in the past three decades in the US . The incidence varies geographically due to increased exposure to ultraviolet radiation . Patients who live close to the equator tend to present at a younger age compared to those who live more distant. The highest incidence occurs in light-skinned people with extensive sun exposure. SCC is relatively rare in people with African or Asian descent. However, SCC in African people carries a higher mortality rate due to delayed diagnosis, because these tumors are more likely to occur in sunprotected areas including the scalp. The most predisposing conditions were scarring processes . SCC is twice as frequent in men compared to women over the age of 50. The majority of SCC in those of African descent arises from preexisting inflammatory skin conditions or burn injury . Individuals with a first-degree relative with SCC may have an increased risk for developing disorder because they share similar cutaneous phenotypes, environmental and genetic factors . The incidence of cutaneous SCC increases with the duration and degree of immunosuppression and is higher in sunny climates. Direct effects of immunosuppressive agents and UV radiation may augment DNA damage because the immune system cannot eradicate percutaneous skin changes, especially in those with HIV, organ transplantation, and longterm steroid use . Arsenic (from contaminated water), radon, and chemical exposure from cigarette smoking may also increase the risk of cutaneous squamous cell carcinoma but more studies are necessary to associate the cause . A subset of patients present with high-risk squamous cell carcinoma, which include sizes > 2 cm, invasion > 4 mm, recurrent lesions, and metastasis to regional lymph nodes . As there is a high frequency of SCC mortality in blacks, prevention and early detection should benefit the patient . There is a need for heightened awareness of skin cancer for African populations that includes cooperation between physicians and patients, with a primary goal to reduce the incidence and mortality . A 37-year-old native African man from Guinea, non-smoker, without any significant past medical or family history, presented with a chronic ulcer to the left side of his scalp for the past four years. He stated that the lesion was a small pimple that progressively enlarged, did not heal, and started to ulcerate. Initially, he was evaluated in France with little improvement. He tried home remedies, which also failed. He denied sore throat, fevers, lymphadenopathy, chills, night sweats, or weight loss. Physical examination found a 5 cm × 5 cm × 1 cm raised, lobulated appearance overlying the normal skin surface with central ulceration (Figure 1). The lesion produced serosanguinous drainage without acute signs of infection. No structural deformity was noted and the patient’s neurovascular status was intact. The purulent fungating ulcer, located in the left parieto-temporal area contained fibrotic borders with some areas of granulation and necrotic tissues. There was a palpable left occipital lymph node. Figure 1: Initial hospital presentation of patient with ulcerative fungating mass on left temporo-parietal region. He was admitted to the hospital for further evaluation. A head CT scan without contrast (Figure 2) showed a large superficial mass in the left parietal region, which extended into the level of the calvarium. There was no evidence of mass effect, hemorrhage, or infarction. 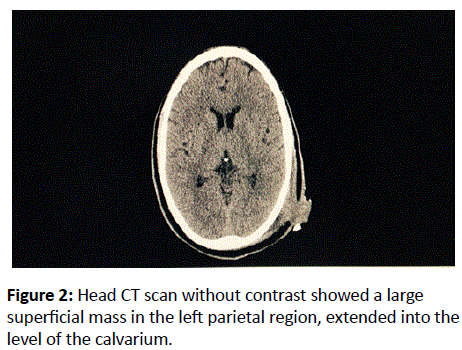 Figure 2: Head CT scan without contrast showed a large superficial mass in the left parietal region, extended into the level of the calvarium. An incisional biopsy of the left ulcerating scalp mass was scheduled three days after admission (Figures 3a and 3b). 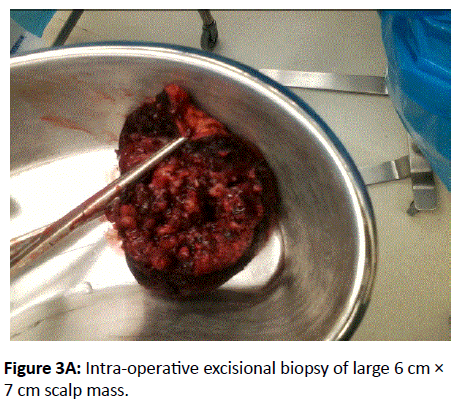 Figure 3a: Intra-operative excisional biopsy of large 6 cm × 7 cm scalp mass. 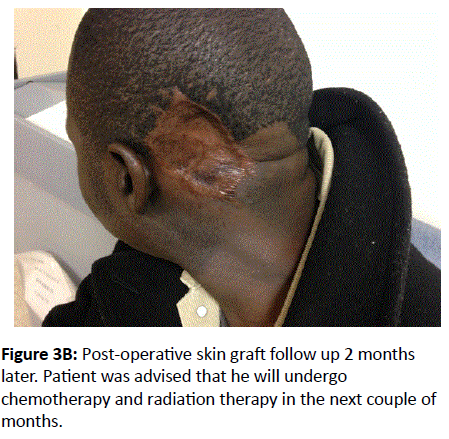 Figure 3b: Post-operative skin graft follow up 2 months later. Patient was advised that he will undergo chemotherapy and radiation therapy in the next couple of months. The left occipital lymph node was biopsied (Figures 4 and 5). 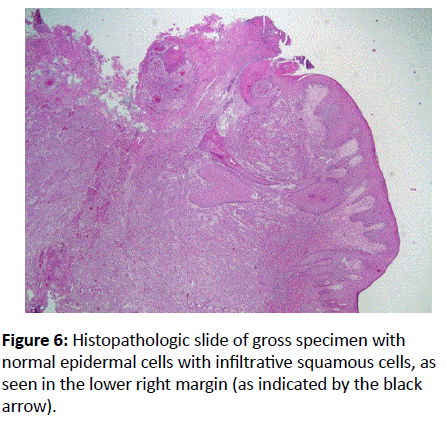 Histopathologic evaluations of the scalp mass, which grossly measured 6 cm × 7 cm, demonstrated an infiltrating well differentiated, ulcerated squamous cell carcinoma (Figures 6 and 7). Evaluation of the excised left occipital lymph node revealed metastatic carcinoma Figures 4 and 5. Postoperatively the patient recovered without complications, with a clean dried dressing over the opened wound. 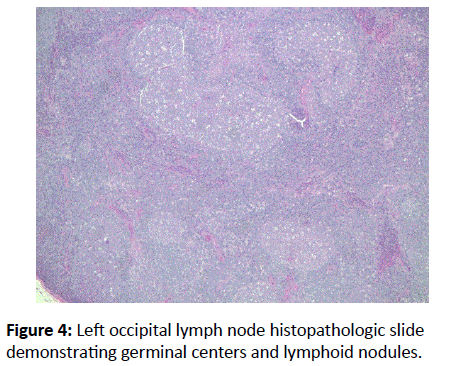 Figure 4: Left occipital lymph node histopathologic slide demonstrating germinal centers and lymphoid nodules. 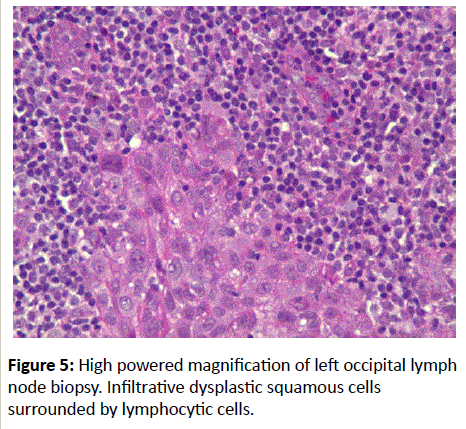 Figure 5: High powered magnification of left occipital lymph node biopsy. Infiltrative dysplastic squamous cells surrounded by lymphocytic cells. Figure 6: Histopathologic slide of gross specimen with normal epidermal cells with infiltrative squamous cells, as seen in the lower right margin (as indicated by the black arrow). Figure 7: High powered magnification of gross specimen showing cellular dysplasia and keratin pearl, characteristic of squamous cell carcinoma. Intercellular bridges shown throughout. Postoperative day 7, the patient returned to the operating room for a deep marginal re-excision to remove any tumor remnants along with a biopsy of a palpable left posterior cervical lymph node. Frozen sections demonstrated acute and chronic inflammation, with granulation tissue and fibrin without residual carcinoma. The posterior cervical lymph node revealed benign follicular hyperplasia, without metastasis. Postoperatively the patient tolerated the procedures well, with a new dressing over the lesion. Postoperative day 11, a VAC dressing over the left scalp was applied to drain serosanguinous fluid (Figures 8a, 8b and 9). 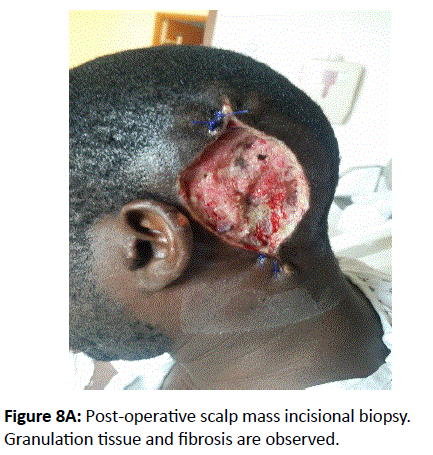 Figure 8a: Post-operative scalp mass incisional biopsy. Granulation tissue and fibrosis are observed. 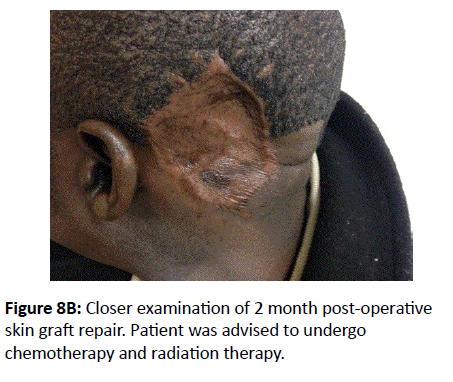 Figure 8b: Closer examination of 2 month post-operative skin graft repair. Patient was advised to undergo chemotherapy and radiation therapy. Figure 9: Postoperative Day 19. Improvement after VAC placement. Diffuse granulation tissue is appreciated. The lesion measures 7 cm × 9 cm. Postoperative day 19, patient underwent a full thickness skin graft (Figure 10), using the skin from his left thigh to cover the open 7 cm × 9 cm granulating wound, along with ampicillin / sulbactam to prevent infection. Clean dressings covered both sites. He was re-evaluated the following two days, and did not complain of any distress. Figure 10: Post-operative Day 21 after placement of skin graft. Skin mesh using skin from his left thigh was applied over the granulated lesion. Patient has tolerated the procedure well. Two months post-operative skin graft repair, the patient was re-evaluated by the surgical physicians. There were no signs of rejection such as inflammation, discharge, necrosis, or edema, nor did the patient complain of distressing symptoms such as headache, nausea, vomiting, weakness or syncope. The patient was advised to undergo chemotherapy and radiation treatment in the next couple months to salvage any recurrence of malignancy. Squamous cell carcinoma is a malignant proliferation of the epidermal keratinocyte. Early recognition and treatment provides a favorable prognosis . Therefore, any suspicious lesion has to be treated. The method depends on diagnosis, lesion size, morphology, location, and patient compliance . Biopsy and histopathologic analysis aid in the diagnosis of suspected lesions. In addition, CT imaging and lymph node biopsies help to rule out metastatic diseases . Excision of the ulcerative, non-healing lesion was the best modality of treatment for this patient to reduce mortality. It is important to note that excision to clear margins is helpful to prevent further complications. This is accomplished under pathologic evaluations of specimens obtained post-operatively. After clear margins are found, the next step is reconstruction usingS split thickness skin graft . Skin grafting is usually performed when defects are large and unsuitable for primary closure or a local flap . In patients of African descent, squamous cell carcinoma is a rare, but fatal form of skin cancer if left untreated. There is limited data that documents the incidence and mortality in this group. Most patients with SCC are Caucasians older than 40 years of age. SCC can also be considered in those with highrisk factors such as ultraviolet radiation exposure, positive family history, chronic immunosuppression, toxic chemicals and chronic inflammation. 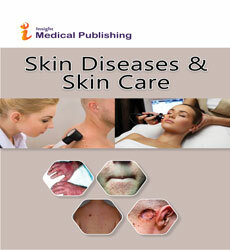 The lesions are often found in sunexposed areas of the skin, which include the head, neck, upper and lower extremities. High-risk patients have lesions that are often diagnosed late, with lesions > 2 cm, local metastases, and > 4 mm depth . It is a rare case to have a young African patient, without any autoimmune diseases, to present with metastatic squamous cell carcinoma of the scalp. It is also rare to note that this particular patient presented a stage 4 carcinoma, based on the TNM system, T2N2M0 . Therefore, this facilitates the importance for physicians to understand the incidence of squamous cell carcinoma in different groups of people. Although debatable, the most effective treatment to benefit this patient is to encourage elective surgery towards a clear margin, radiotherapy against the affected nodes, and adjuvant systemic therapy to prevent recurrence. In addition, an oncologic evaluation with close follow up should be initiated to prevent signs of relapse. The patient is a 37-year-old man, native to Guinea, Africa, who only speaks French. An interpreter translated for him. He initially described the lesion as a small pimple, and did not seek medical advice for treatment four years ago. He believed doctors practice “black magic” and instead used herbal remedies (Figure 11). He visited France for an evaluation of the skin lesion, and only received laboratory work up. When he presented the lesion to the hospital, he stated that it never healed, and became larger, despite the home remedies used (Figure 11). 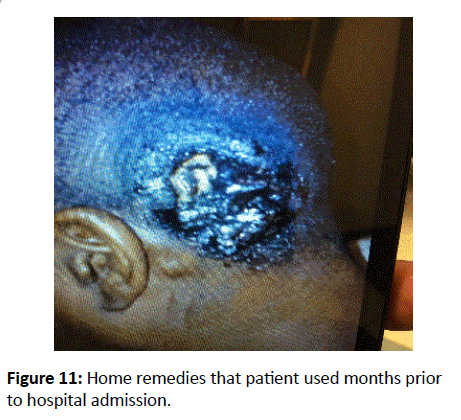 Figure 11: Home remedies that patient used months prior to hospital admission. We would like to acknowledge Shamah Iqbal, MD for her contributions on pathological evaluations on the gross and microscopic specimens. Skin Cancer Foundation Squamous Cell Carcinoma (2015) The Skin Cancer Foundation. Stulberg DL, Crandell B, Fawcett RS (2004) Diagnosis and Treatment of Basal Cell and Squamous Cell Carcinomas. Am Fam Physician 70: 1481-1488. Mora RG, Perniciaro C(1981) Cancer of the skin in blacks. A review of 163 black patients with cutaneous squamous cell carcinoma. J Am AcadDermatol 5: 535-543. Gamble M, Tocci E (2015) Poorly differentiated squamous cell carcinoma arising within a lesion of discoid lupus erythematosus in an African-American woman. JAAD Case Reports1: 138-140. Kharazmi E, Fallah M (2012) Familial risk of early and late onset cancer: nationwide prospective cohort study. British Medical Journal 345: 8076. Berg D, Otley CC (2002) Skin cancer in organ transplant patients: Epidemiology, pathogenesis and management. J Am AcadDermatol47: 1. Leonardi-Bee J, Ellison T, Bath-Hextall F (2012) Smoking and the risk of nonmelanoma skin cancer: systemic review and meta-analysis. Arch Dermatol148: 939. Veness MJ (2007) High-Risk Cutaneous Squamous Cell Carcinoma of the Head and Neck. J Biomed Biotechnol 7: 80572. Halder RM, Bang KM(1988) Skin Cancer in Blacks in the United States. DermatolClin 6: 397-405. Motley T, White K, Clyde J (2014) Squamous cell carcinoma of the foot: A Case Report. The Foot and Ankle Online Journal. Kwon KH, Lee DG, Koo SH, Jo MS, Shin H (2012) Usefulness of V-Y Advancement Flap for Defects after Skin Tumor Excision. Arch PlastSurg 39: 619-625. Rudolph R, Zelac DE (2004) Squamous cell carcinoma of the skin. Plast. Reconstr 114: 82-94. Perez GL, Randle HW (1995) Natural history of squamous cell carcinoma of the skin: a case report 55: 34-36. National Comprehensive Cancer Network (2015) NCCN Guidelines Squamous Cell Cancer. American Joint Committee on Cancer, Chicago, Illinois.